Looking for more useful tips from locals in Paris? Make sure you get yourself copies of our 2019 INSIDR Free Paris Travel Guides! If you are planning to travel in France for a short trip or a for a long stay, you may be wondering how to save money on roaming data. Many telco company have international travel plan but with limited option and data. Here we give you our best tips for saving on roaming data while traveling in France by sharing how to access WiFi in French cities and more specifically – access Paris Wifi. We all know roaming fees are extortionate, so the best way to avoid roaming fees abroad is to go into your personal settings on your phone, turn off ‘mobile data’ and ‘data roaming’. You should also turn off any applications that use data in the background or sync automatically and download offline apps for France! If you are driving around in France, you may not be able to use the GPS apps on your phone as it will use a lot of data. If you start your stay in Paris, you’ll probably have a decent free wifi Paris connection in any type of accommodation. Most hotels and apartments will have a good connectivity included in the price of the room. It will be the same in most of the biggest cities in France. Simply ask for your Paris free WIFI login when you check-in to your hotel (if free WIFI is on offer). 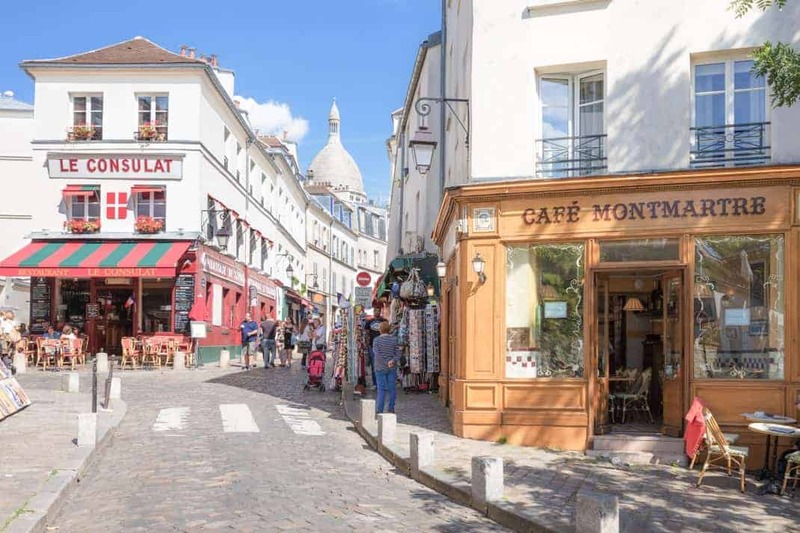 However if you travel outside of Paris, it can be difficult to find accommodation with a good connection. Most of holiday rentals will not have wifi connection available. Even in little local hotel, you may experience a very slow and not steady internet connection. When traveling around in France, French people use their personal smartphone to access to the internet. There are free wifi zones in the biggest city – Lyon, Marseille, Bordeaux. Free wifi zones can be found in public libraries and in the biggest museums. However the connection is often quite slow. In Paris free WIFI login often requires you to create an account and log into a “session”. Sometime there is a time limitation. And the connection is not very secured. We don’t recommend doing any transactions or connect to personal accounts like online banking account. To be able to use your own phone for calling and wifi in Paris, you’ll have to check first if it’s unlocked and compatible with tri-band/GSM. If this is done, you can buy a sim card available at mobile stores such as SFR boutique, Orange and Free. You’ll find mobile stores in every main cities or in shopping malls. Local calls are affordable but international calls and mobile data usage can be very expensive. The best method to avoid roaming fees while travelling is to go to settings on your phone, turn off ‘mobile data’ and ‘data roaming’. Also turn off any applications that use data in the background or sync automatically and download offline apps for Paris! 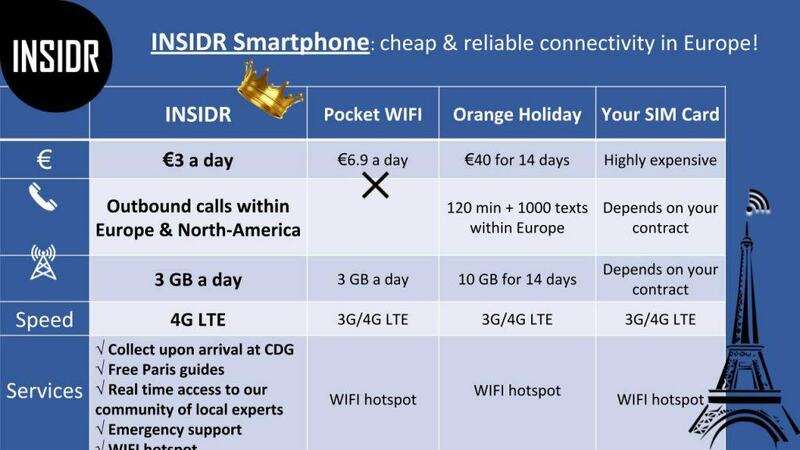 If you’re travelling to Paris on a budget but still want to stay connected, the best, cheapest and easiest way is to rent one of our INSIDR smartphones! With low costs and direct delivery you can have a cellphone rental in Paris that will make your stay stress-free. Book your smartphone service ahead of your trip to save you all the stress and precious time! You can book your smartphone service here.